In her new series of mixed media paintings and sculptural works, artist Susan Melly accomplishes a resolution of disparate processes, techniques, stylistic languages, and new mediums that has the impact of a culmination, but is actually a breakthrough. 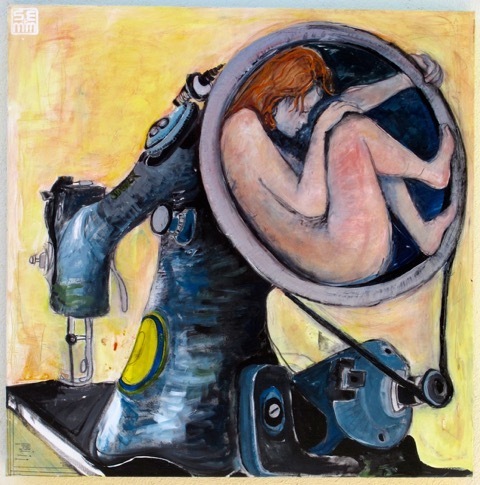 Though naturally given to gestural abstraction, in "Mother Machine" Melly offers a more concrete set of images and stories than anything she's previously done. 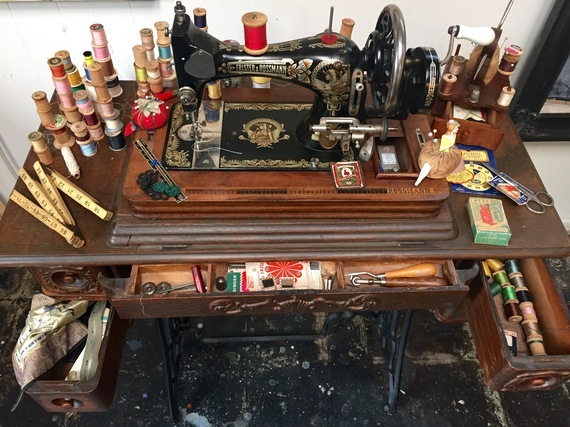 She employs iconography and primary materials culled from her late mother's archive of retro, old-timey dress patterns annotated with oddly evocative, eccentrically worded directives on approaching the female form. She is equally inspired by the stately odalisque of a curvaceous, ornate, vintage sewing machine -- which as a stand-in for Melly's mother as well as a metaphoric touchstone for the female body as a site of both public and private meaning, holds pride of place in both the compositions and the installation. The most radical shift in her practice has to do with the decision, for clarity of intention in terms of her personal motivations for undertaking the series, to paint figuratively after a career of working in expressive abstraction and pure invention. 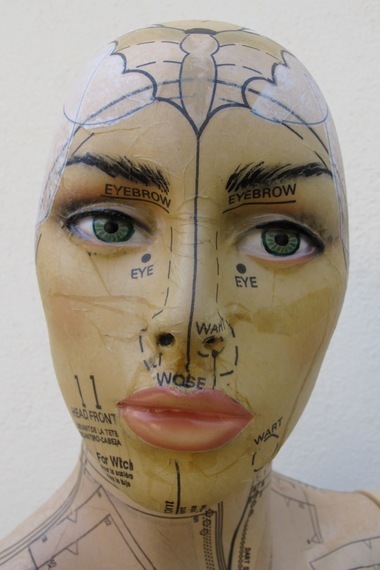 Nevertheless, it is the related suite of dressmakers' mannequins that first capture the eye and the imagination with their emotional and visceral impact of immediacy and mystery. 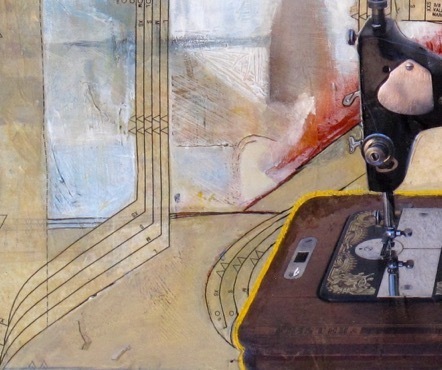 She covers the vintage-style mannequins she favors in both collaged and rendered patterns taken from the aforementioned archive of sewing papers, in iterations of industry vernaculars in words and shorthand marks like arrows and triangles. 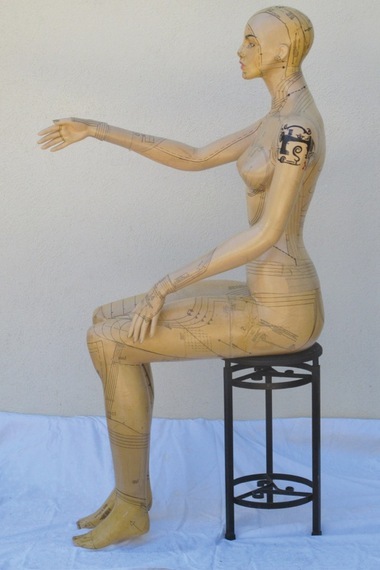 She uses not only visual cues but also indicational texts in metonymic allegorical placements on the figures, evoking garter belts, ritual tattooing, or cuts of meat, making of them new connections in the manner of found-object works. 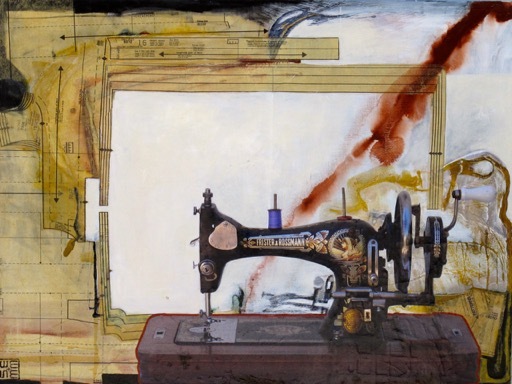 When it comes to the paintings, one might think their protagonists would be the mannequins in some formulation of scene or narrative sequence -- but instead, it's her sewing machine. A stand-in for the mother whose loss these works address, the entire suite of mixed media works on canvas is dedicated to its surrealistic, anthropomorphic adventures across an architectural universe of memory, poetry, and archetype. Melly paints its seductive, sensual, undeniably feminine appeal in a plurality of vibrant and fraught modalities, deployed in the compositions using forced perspectives and other manipulations of space and surface that contain the impulse for pure abstraction she can't tune out. She further includes such materials related to the machine's functionality as are found elsewhere in the series, and occasionally its photograph. Portraying themselves while also activating the picture plane, these elements operate inside the image while spinning off into other realms of style and substance -- the same dynamic of emotional appropriation that animates the sculptures. In Melly's unique resolution of conceptual and art-making processes, imagery is a closed system, yet her salient marriage of abstraction and narrative reaches into areas from feminism to art history and autobiography, reorienting what is by definition predetermined into a fresh new set of metaphors and meanings. Pulse of LA opens Sunday, March 22 at Art Core in Little Tokyo. Mother Machine opens Saturday, April 11 at Gallery 825 in West Hollywood.